I've posted pictures of this before, but just realized I haven't told the story about my pot belly stove. It started a couple years ago when I started looking for a caboose stove to put in our den/railroad room. I was in no real hurry, so my search was pretty casual - and I didn't find anything. Fortunately and serendipitiously (sic? ), I happened to mention at dinner during the Springfield show last year what I was looking for, and somebody said - "I have a railroad stove - it's not a caboose stove, but you're welcome to it if you want it." Turned out that the stove came out of the New Haven Railroad's South Main Street crossing shanty in Millbury, MA and had been used for many years to heat the parlor car that's now at the Steaming Tender restaurant. Coincidentally, that's where we also happened to be eating dinner at the time. Stove pictured "in-service" after retirement from the railroad. Also coincidentally, the stove had been used to warm volunteers who worked on the Shoreliner magazine years ago. So moving it over to the NHRHTA Photo Library room to warm the present-day volunteers on Thursday nights seemed especially appropriate. While I'd started out looking for a caboose stove, those tend to be pretty boxy and utilitarian. I think this little pot belly looks a lot nicer in the railroad room, which has a lot more in common with a shanty or station than a caboose anyway. Once I got the stove home, I did some further research on it. Turns out it was produced by the Stamford Foundry in Samford, CT (an on-line industry for the New Haven). The "Ledger Model B" was their pot belly model stove and the No. 9 was their smallest version. It heats up our large den/photo library room, so it must've been more than adequate for a little crossing shanty, even if it was uninsulated. 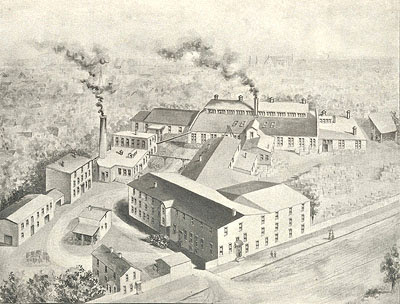 The Samford Foundry. Click here for more details. Fortunately, I already had a hearth and a tie-in to a separate flue, so all I really needed to do was give it a once-over and connect it. As part of my combo Christmas/birthday present, the Missus paid to have a stove restoration shop go over it, convert it from coal to wood, weld a couple cracks, sandblast it, reseal it, and give it a new coat of stove black. It came back looking like new, but after firing it up I noticed that a couple of the seals weren't completely "sealed" - I could still see some of the flame through the joints. No worries - I expected there'd be a "settling-in" period. So friend BillC (who was visiting during this year's Springfield show) and I got some stove cement and took apart part of the stove. The stove was built in sections, each cast separately and connected together with screws, bolts, and threaded rod. It was a little bit of a pain to get it apart and then have to scrape, chisel, and wirebrush the sealing surfaces. But once that was done, all I needed to do was add a "generous" bead of the cement. Once it was all put back together and "cured" it was time to fire'er up again. Have you ever added too much batter to a waffle maker? Well, I guess I should have known the cement would expand when heated. Fortunately, it's black - and I was able to scrape most of it away as it came out (no, I didn't use my finger) so it isn't noticeable. At least you don't see any flames anymore! And after another minor snafu when I realized that even "high temperature" paint will chip off if not fully cured, things are finally settling in nicely. We've fired the stove up a bunch of times and it certainly makes for a wonderful, railroady atmosphere. All I need now is a cracker barrel and a checkerboard! Just purchased a Stamford Ledger stove exactly as your picture . Was curious what you had to do to convert it from coal to wood ? Another question is where did you find the 4 in. stove pipe ? Thank -you ! Hi Dale and thanks for stopping by! Hope you're enjoying the blog. All I (or, rather, the guy I gave it to for refurbishing) did to convert it was to weld the grate in position. And I don't even think that was necessary for conversion - but it was necessary in the case of my stove since the grate couldn't stay in place. As for the 4" stove pipe, it was special ordered from a place in NJ by the guy I had install the stove originally (he's an expert in dealing with older stoves). Hope this helps! And send a few photos of your stove when you get a chance - would love to hear the story of how you got it. Hi. I found this blog because we have a Stamford Ledger B in the No. 20 size (Yes, it's huge!) and I've been looking for more information. The people that owned the house before us installed it in the barn which he used as a studio. The house is from 1830 but doesn't have a stove or fireplace (although there is a foundation for a fireplace.) We have no idea if this was ever used in the house. I'm trying to figure out what to do with it. It's in very good condition--very little rust--but is missing the guard rails and our model apparently had glass in the door. (Now there's a piece of sheet metal to replace the glass.) I'm really curious if the glass was a single curved piece or made up of smaller, flat panes. One thought I had was to put the stove outside in a covered porch area. It seems too big for inside but could be great for outside.